Good Morning! 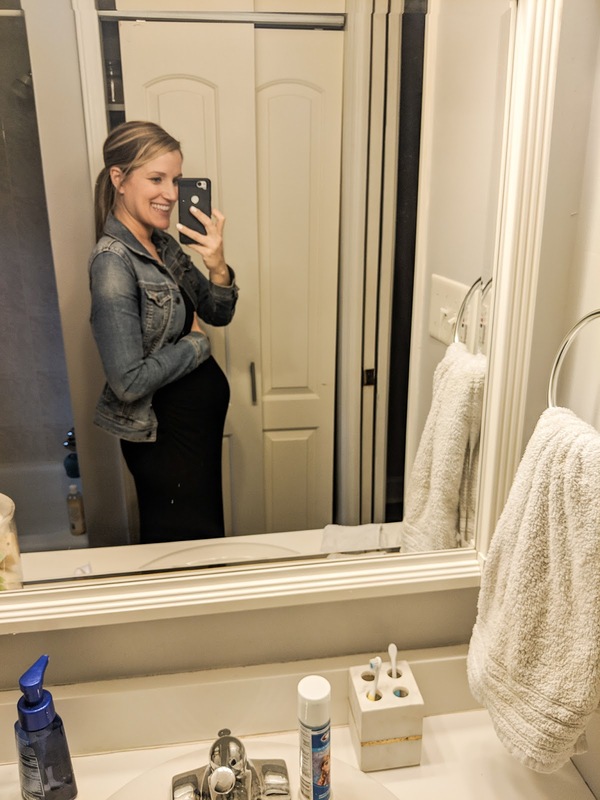 I haven't done a bump update in awhile and wanted to share how things are going. I have hit the sweet spot of pregnancy where I no longer feel nauseous, I have my energy back, I have a noticeable bump, but am not uncomfortable yet. This is as good as it gets!! I know my days in this stage are numbered so I am trying to soak it in as much as I can. And both of these pictures below are from last week, one in the morning and one at night. Isn't it so funny that depending on the time of day your bump can look so much bigger? How are you feeling? I feel great now! I had written a few weeks ago about how miserable the first trimester was with nausea, but we seem to be in the clear now thank God! The only negative is insomnia. Sometimes I wake up in the middle of the night to go to the bathroom and sometimes I wake up for no reason at all, but once I'm up I am wide awake. On Saturday night I slept from about 9:30-1:30 and then was up for the rest of the night, and that seems to be the new normal. It luckily only happens 1-2 times a week and I actually am not exhausted the following day. Maybe this is just my body prepping me for the lack of sleep soon to come? Are you craving anything? Chips and salsa still and Honey Bunches of Oats cereal with almonds... I can't get enough! Do you think it's a boy or a girl? I have had multiple dreams that this baby is a boy, so I'm guessing boy at the moment. Really though, I have no idea! While we technically could already know (our doctors know and haven't told us!) we are still trying to hold out until baby is born. We had such a great experience with waiting until birth last time and want to have that feeling again! Are you still exercising? I'm trying to! I get my walks in every single day and I am trying to do some very low-key, light weight training (mostly legs and arms). I don't do the full 28 minutes of BBG anymore and stick to 14 minutes instead (if I can even make it that long-- some days I'm not feeling it and can only make it through the 7 minute first round). I follow Kayla's pregnancy modifications and just listen to what my body is trying to tell me. I love that my Fitbit has a heart rate monitor and I can make sure I'm keeping my heart rate in a safe zone (I try to stay below 150 bpm). Have you felt any movement? YES! I felt the first kick about 2-3 weeks ago and now this baby is moving around in there nonstop! It is one of those feelings that NEVER.GETS.OLD. Baby is still small enough that it feels more like the flutter of butterfly wings as opposed to the painful kicks like the end of the third tri. 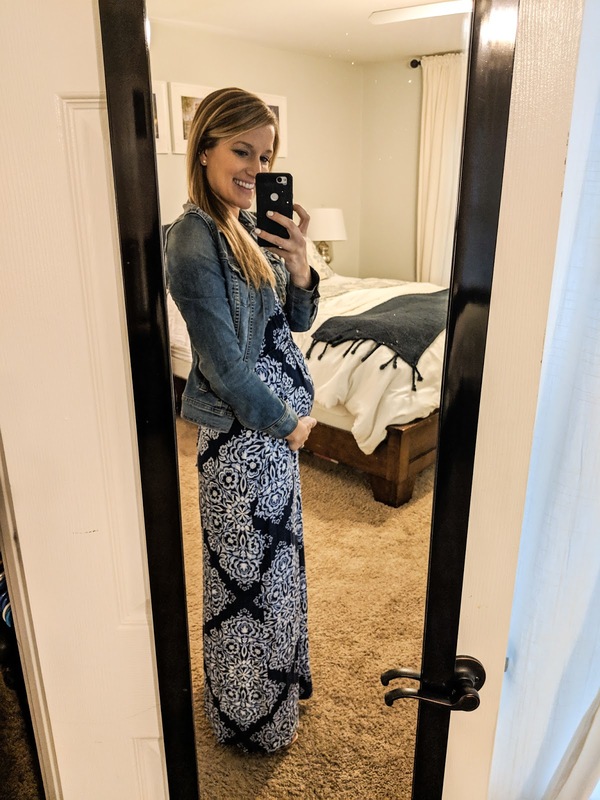 Favorite Maternity Clothes? So far the only maternity things I'm wearing are my exercise clothes (yoga pants haven't fit for awhile!) and I have a pair of jean shorts. My shorts are from Old Navy, from my last pregnancy, and here is a similar pair from Gap. 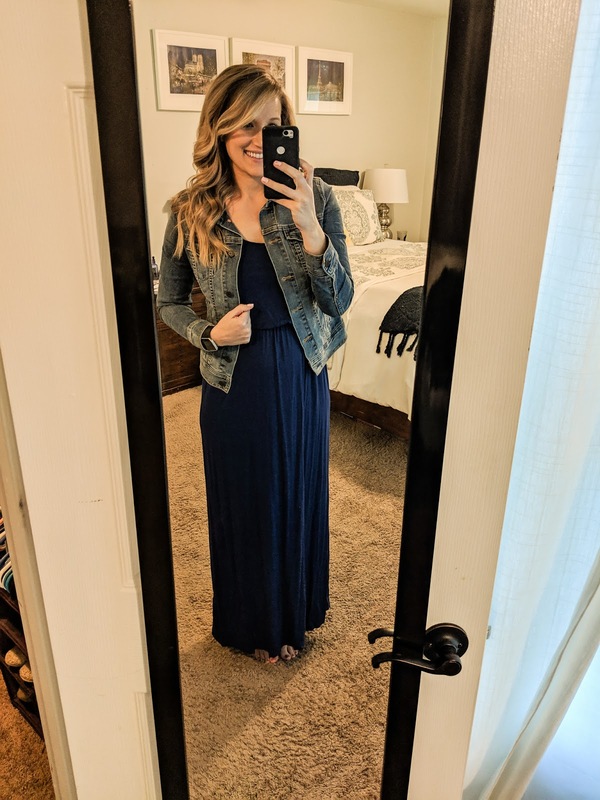 As you can see from my pictures I'm mostly living in my non-maternity maxi dresses and denim jacket. I hated maternity clothes last time (there was nothing that fit my style) and tried to avoid them for as long as possible, so I imagine I will be doing the same thing this time around. Anything else? Ladies, the pregnancy brain this time is no joke! I don't remember it being so bad last time but I am forgetting EVERYTHING. Devin said the whole thing with pregnancy brain is that you forget, so maybe it WAS this bad last time and I forgot... that makes me laugh because it's possible! I am wondering if maybe I have more on my plate to keep track of this time around so I am forgetting because I'm busier. It's also possible I'm just looking for an excuse.. ha! Thanks for stopping by to check in with this baby! 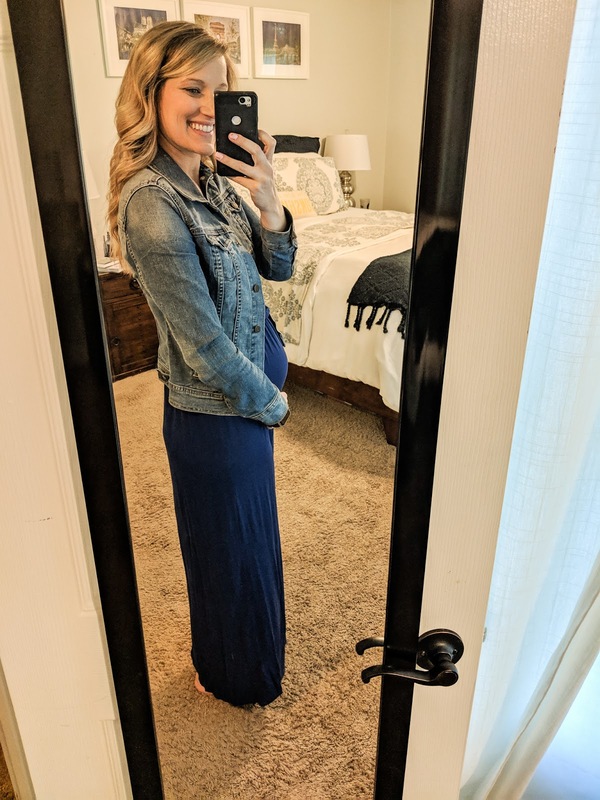 My plan is to do a bumpdate every few weeks, so stay tuned! Congratulations on this wonderful season of life for you!